Diva's Bookcase: Blogfest 2010: Oodles Of Prizes To Win! Blogfest 2010: Oodles Of Prizes To Win! Blogfest 2010 is hosted by Cinnamon at A Journey Of Books. It's a huge blog party that starts Sept 10 and ends on Sept 12. There are over 250 amazing blogs participating and tons of awesome prizes to be won. There will also be a massive Blogfest grand giveway. Head on over to http://ajourneyofbooks.halfzero.net and click on the Tracking Site link to head to the exclusive tracking site. Once there you can register with a valid email address (to be used solely for the purpose of contacting the winner). This site will allow you to track your progress through BlogFest 2010! You can log on from anywhere at any time and continue where you left off. The best part is that every blog that you visit and mark off through this tracking site will give you one entry into the massive giveaway! There is a great collection of books, goodies and other swag that is looking for a new home! The contest is only open to US residents. You must be a follower of the blog (thru Google Friend Connect) and leave a comment on this post that includes your email. Easy peasy. Winner will be randomly chosen and announced on the blog. Thank you for the great giveaway. I am a GFC follower. I'm a new GFC follower. Thanks so much for the great giveaway! I'm a new follower. Nice prizes. I'm a follower via GFC. I've been wanting to read Damaged! I'm a new follower. Bride of the wolf looks awesome! Hi, great giveaway! I'm an old follower. Have a great weekend! Nice giveaway. I'm now a new GFC follower to your site. Am a [new] follower. Thanks! Thanks for the great prize pack giveaway! I'm a follower!!! Great giveaway! New GFC follower. I'm a follower and thanks for the giveaway! 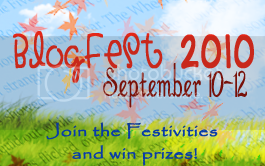 Happy Blogfest! Just stopped by to show my support and thank yu for the giveaway. Have a great weekend. Thanks for the chance! I am a follower. Momma Teri follows you with GFC. New follower:) Thanks for the giveaway! thank you so much for this and im a follower too. Very nice! Thanks for the giveaway. Great contest! I am a Google Friend Connect. Awesome giveaway! I'm a follower! Thanks a bunch! Finding so many wonderful sites. just saying hi! Love your pics.. I heart your book boyfriend list! And You demon & Vamp loves, Cole and Damon, SWOON!! I am a new GFC follower. Have a great weekend!! follow gfc publicly. have a great weekend! I am a new follower and would love to be entered! Thanks! I'm a new follower. Thanks for the giveaway and Happy Blogfest. great giveaway - these look like great books! Happy BlogFest! & What great prizes. Thanks for the giveaway. I am following on GFC as Melanie L.
I'm a GFC follower. Thank you for the giveaway! I am a GFC follower. Thanks for the entry and have a great weekend. Thanks I am now following. New GFC follower here! Thanks for the great giveaway! I am an old follower of your blog (skyla11377). Thank you for the giveaway. I am a GFC follower. I love these authors. Oh yeah!! Love the book selections. Great giveaway!! I am an old follower! Thanks for the giveaway. I'm a new follower via GFC. Thanks for the awesome giveaway, I follow via GFC. Thanks for the amazing giveaway! i follow via GFC!! I love the colors of you blog! Thanks for the great giveaway! Also don't forget to check out my amazing blog design giveaway that ends 9/12! new follower on gfc, nice blog!